GoMobile Repair > Uncategorized > This $10 Device Could Save You $1000’s! This $10 Device Could Save You $1000’s! Phone holders for your dashboard aren’t just for nerds (like us) and smartphone enthusiasts anymore! Mounting your iPhone or Android on your dash instead of keeping it in your lap can literally save lives. We’ve all seen phone mounting systems inside people’s cars but more often than not we see people illegally driving while texting instead. No more excuses, Vancouver! Thankfully, GoMobile Repair is your one-stop cell shop for your dash-mounted phone kit needs. Not only can these devices ensure your safety but they are incredibly affordable as well! Still not convinced? Keep reading. It’s one month into ICBC’s Distracted Driver campaign and we’re willing to bet you know at least one person that got slapped with a hefty ticket (or was it you? Shhh, your secret’s safe with us). We won’t shame them (or you) because we all know better and that $368 fine is punishment enough. No call, text or email is so important to put your life or the lives at others at risk. Furthermore, if you get caught twice within three years, you can get slapped with up to a $2000 fine! Ouch. Since 2010, the use of cell phones while driving in Greater Vancouver has been, and still is, illegal. Did you know that this also includes while you’re stuck in traffic or at a red light? The police have upped their patrol and stories are aplenty of those who got busted while in snail pace traffic. Use a hands-free, dash-mounted smartphone holder if you need to use your phone in the car. Great for getting directions while using Google Maps or listening to music. 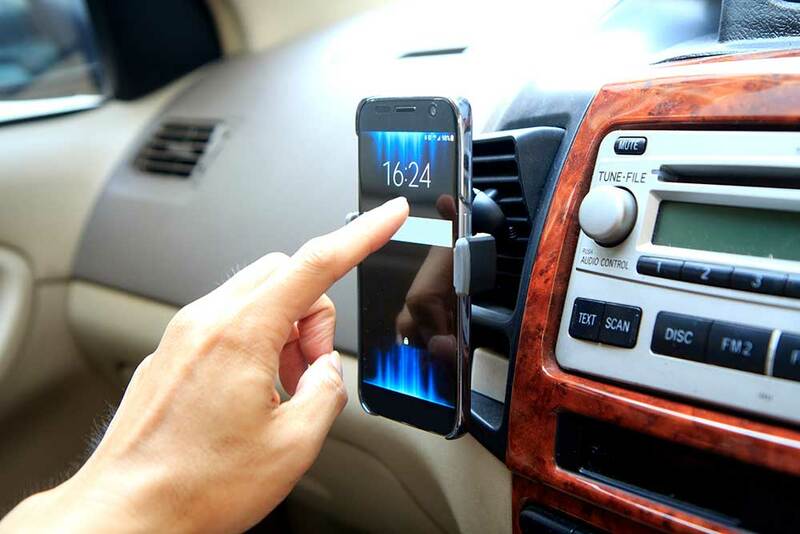 Check out our shop for our line of hands-free car accessories for your cell phone. Yours for as low as $10. Cheap! Turn your phone off or switch to airplane mode to avoid the temptation to cave when you get a call or notification. Out of sight, out of mind! You trust your friends, right? Get your passenger to take on phone duty. Pull over! And no, stop lights and stop signs don’t count. You’re still in the danger zone of being a distracted driver and getting a ticket. Load up on podcasts or music playlists for those long traffic jams to keep your mind active and hands off your phone. But Every Call IS Important! Okay. We get it. It’s hard to ignore that incessantly ringing mobile! So, if you must answer every call, drop by GoMobile and we’ll help you set up your device to have a safe hands-free experience while on the road. We are currently selling the Naztech MagBuddy mounting system line of products to help you legally use your device while driving. Just remember, that mounting your phone on the dash of your car doesn’t mean you can text message people, play games or use Facebook! When you use a phone holder in your vehicle, stick to calls, music and maps – stay safe out there, Vancouver. Previous Previous post: Do You Have the Right to Repair Your Phone? Next Next post: Our Cell Repair Shop Now Open Sundays!